Several years ago I acquired this recipe from a magazine called Traditional Home. I made this and it was delightful! The recipe came from a grouping called Girlfriends Lunch Recipes...which included Caviar Sunflower and Shrimp & Scalops in Puff Pastry Shells! 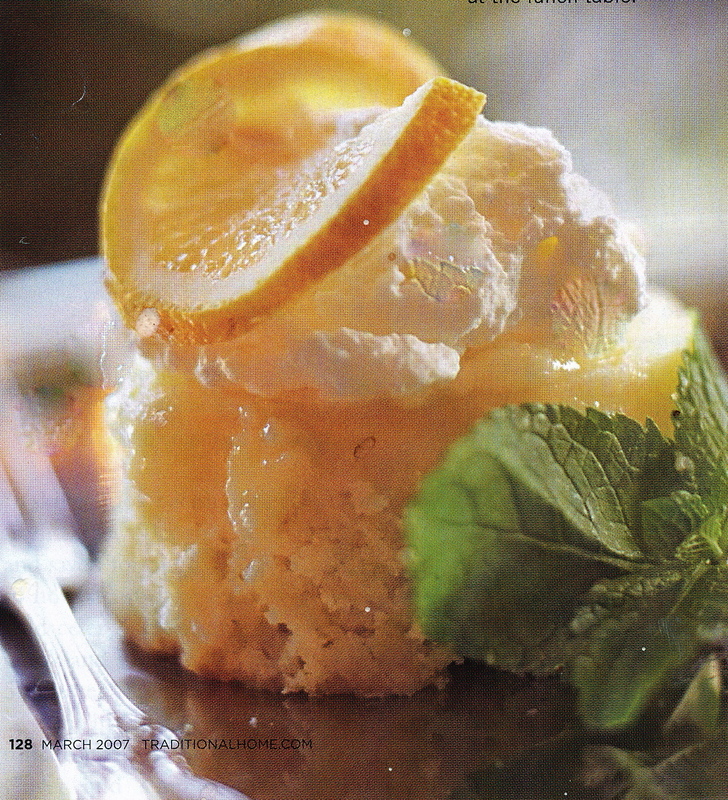 Since I love things made with lemon I naturally had to try this recipe! Lightly coat six (10 ounce) custard cups or ramekins with nonstick cooking spray; set aside. Add sugar, beat until combined. Beat in egg yolks until creamy. Gradually beat in lemon peel, lemon juice, flour, salt and milk; beat for 3 minutes on medium speed. In large mixing bowl with clean beaters, beat egg whites until stiff peaks form. Fold yolk mixture into beaten whites. Divide evenly among prepared cups. Place in roasting pan; add hot water to teach halfway up side of cups. Reduce heat to 300F and bake 30 minutes more or until knife inserted near center of each comes out clean. Loosen sides and invert onto plates. Garnish with whipped cream, lemon slices and mint. Thanks Liz, I will try this for my husband's birthday, which is coming up soon. Sounds delicious! This recipe sounds and looks yummy. After I get off the diet, I would love to try it.